Enjoy the gorgeous views of the Blueridge Mounains while snug and warm by the wood burning fire place. Or enjoy the views from the 6 person hot tub on the lower deck. Three separate bedrooms, King in Master and queen beds in two other separate bedrooms. Sleeps 6 adults, but I will allow up to 10 people assuming that families may have children or young adults that don't mind sleeping on air mattresses or the couch. I don't provide air mattresses. Beautiful granite kitchen and gas grill on the deck. Amenities include, pool table, cable television and internet, jetted tub in master bath. Enjoy your morning cofee while looking out over the Blueridge mountains on the covered deck. Large two level deck with plenty of seating for six. I am a CPA that is semi-retired and my wife is a hair dressor. We live in Woodstock, GA.
We love the mountains and Blueridge, Georgia. I love trout fishing, hiking and long mountain views. Absolutely love watching the sun come up on the back porch with coffee! Looks out to the mountains off porch. Porch is on eastern side of house and has a nice sunrise view in the morning and a beautiful moon rise as well. In pantry behind folding doors. Cable internet from ETC cable. Really a "great room" with nice large L shaped couch, fireplace, large TV with ETC cable, DVD player and receiver with speaker system and pool table. Induction Range with Electric Oven, Full Kitchen with dishwasher, microwave, refrigerator with ice maker. Granite Counter Tops and large butcher block island. Kitchen Faucet is a touch faucet. Large flat screen in Living room, Large flat screen in Master bedroom and small TV in one bedroom. Receiver that can play your music from a speaker jack. Installed speakers throughout home. While the cabin living area is all on one level, there are four steps that a person needs to go up to get into the cabin. I have had one customer in a wheel chair that had there own ramp and were able to use the cabin with the help of her family. Six person Hot Tub on lower deck with nice view. Overall we enjoyed our stay in Monte Caprina. We had a very nice vacation. With two small children, we appreciated that the bedrooms were all on one level. The view was wonderful. However we had some serious housekeeping and cleanliness concerns. When we arrived there were dirty dishes in the dishwasher and wet towels in the washing machine, both of which we cleaned ourselves. There were open condiments in the refrigerator and a couple of eggs. The microwave had crusty food splatters, which we also cleaned ourselves. There was a man's razor out in the bathroom. Together these oversights made us really question the overall cleanliness of the home. When we brought up the concerns with the owner after our stay he was rude and unapologetic. The cabin was incredible. It has EVERYTHING you could ask for and more. I was even saved by you ha omg a coffee grinder. Bought whole beans by mistake!! We will definitely rent again. It is just beautiful and so peaceful! Thanks for your kind words. You and your friends are welcome anytime. Beautiful place and nicely equipped. House was perfect. Nice hot tub for friends. Loved it! We took a girls weekend trip at Monte Caprina and it was amazing! 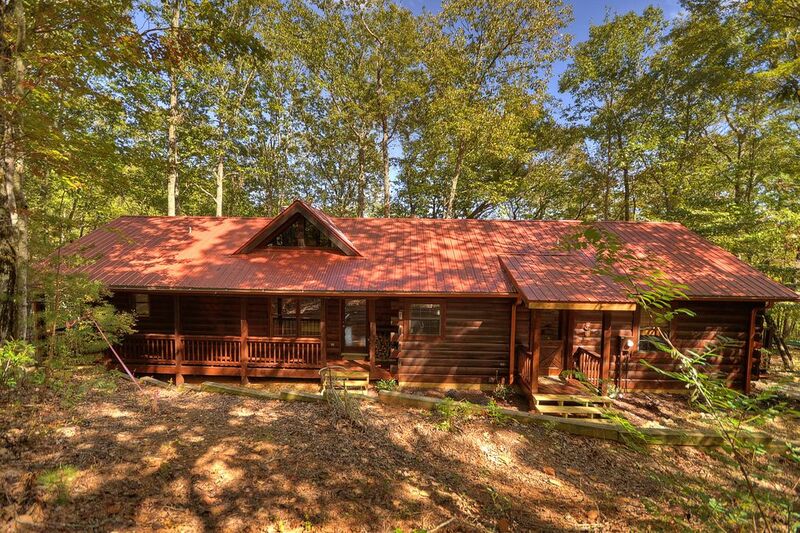 The cabin has everything you could need and is gorgeous. We loved the hot tub, the 2 fire places, and the well appointed kitchen. The views are spectacular and we even had a deer come right into the yard. The owner, Mark Hall, was very responsive during our stay. Overall, the best girls trip I’ve taken. I’d love to go back sometime. Thank you for the great review. I'm glad you had a good time. It was just the right size for our group of 6 adults and 2 children. The cabin is accommodating well equipped with great views in a great location, but the kitchen was infected with roaches. When we turned on the oven to cook our dinner they came out and never left, we were spraying and killing them the whole time. We were paranoid about the food the whole time, because they were on the stove, the island, the refrigerator, in the cabinets and trash can. We made the best out of the situation managed to have a good Thanksgiving. But had to make sure we left the bugs behind did not want to bring them home with us. It also needed a good dusting. Yes we had some bugs. I hired a pest control company in October and we treated the house. I had no complaints about bugs for three stays. I was in the kitchen the day before they arrived and did not find any bugs, but I am thinking some new eggs hatched during Callie's stay. Since their stay, we have treated the home again and I can't find any new bugs. I will constantly monitor this situation.